I found this recipe in Fran McCullough's Living Low Carb, one of favorite books for cooking diabetic. This recipe still contains sugar from the natural fruit, but buying strawberries in season means you need little added sweetener. Butter pie plate with wrapper. Grind 6 almonds in processor until powder, sprinkling over the pie plate. Grind remaining almonds with Splenda and sugar. Mix with butter until it makes a dough. Press into pie plate evenly. Bake 15 minutes at 350 or until edges brown. Cool to room temperature. Cook strawberries in saucepan with salt and flour over medium heat. Break them with spoon to release juices and stir often to prevent scorching. Cook until jam consistency, roughly 10 minutes. Add Splenda to taste and set aside to cool. While the strawberries are cooking, beat cream cheese until smooth, adding milk or cream if needed. Add vanilla to cream cheese. When crust cools, pour cream cheese first. Spoon strawberries on top. Refrigerate at 1-4 hours. I plan to freeze the leftover pie until firm, then wrap individual slices for the freezer. Total cost of pie with on-sale ingredients was less than $5, and the result was more delicious than the standard supermarket pie. Also, my strawberries made a bit too much filling and could have been reduced a bit more. This sounds wonderful! I may have to try this. Possibly use a different crust, but definitely worth trying! By the way, I love your blog. Wow, Laura, cabbage for 5 cents a pound? I guess I would have finally tried making gallons of freshly fermented sourkraut! 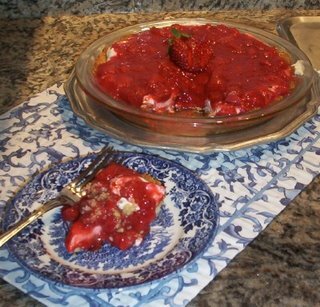 Nancy, I have seen other versions of this icebox-style pie at all-recipes.com, which use an almond cookie crust instead. It's not low-carb, but it still has that essential almond flavor to pair with the berries. First off HAPPY BIRTHDAY to you and may you have many more. Next, the pie looks really good. I like the idea of freezing individual slices of it for later. Never know when you will need a slice of pie late at night after the kids are off to sleep. :-) I use to hide small chocolate bars in the freezer inside an empty box of frozen veggies so that the kids wouldn't find it. No way they would look inside of that! Keep up the good work you are doing here. We are all getting blesed by your hard work. Happy Birthday! My birthday is on Sunday. I need a wheat free crust for birthday cheesecake that falls over Passover. Do you think this crust would go well with cheesecake? Mothersong, sorry I just noticed your question! Yes, this would make a great cheesecake crust. I usually make an identical one using pecans instead of almonds, because they are cheaper in my area. Really, any nut will work as long as it goes with the flavor of your cheesecake.